James McEwen, a lawyer who studied at the University of Edinburgh, was first apprenticed in his father's firm in Dundee. He continued as sole operative after his father's death. James died suddenly, aged 48, of typhus, leaving a widow and daughter. Not known - James McEwen's grandfather, Rev James McEwen, was Minister of the Associate Anti Burgher Congregation of Dundee. He served for 33 years. James McEwen attended the University of Edinburgh where he studied Law of Scotland and Conveyancing during the years 1834/35. Thereafter, he was apprenticed to the firm of 'McEwen & Miller,' writers. His father, David McEwen, was a partner in the firm. James himself became a partner in the firm of 'D & J McEwen.' 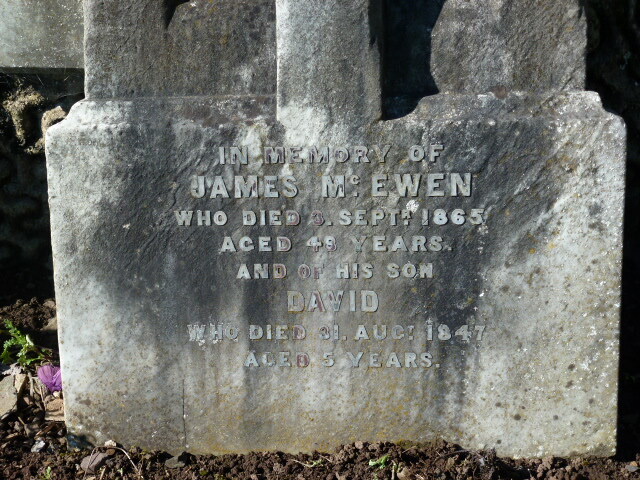 After the death of his father, on 27-04-1844, James carried on business as James McEwen, writer. The firm of 'McEwen & Miller' and the subsequent firm of 'James McEwen, writer' both operated from 6 High Street, Dundee. This address remained the location for James' business until his untimely death in 1865. The surname for James McEwen was occasionally written as ‘McEwan’ but ‘McEwen’ appears to have been the more consistent spelling. 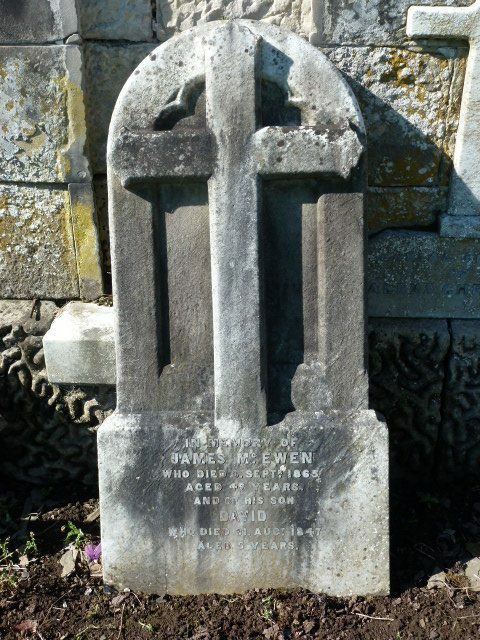 It is stated in a typed and handwritten note in the ‘Lamb Collection’ called ‘Notes on McEwen Family,’ that James had at least three siblings who died in infancy. James himself had one son, who died aged five, on 31-08-47. Records of burials at the Howff show that James and Christina had a stillborn daughter, interred there on 07-08-1843, and that their son David died, aged five, of ‘water in head’ and was interred there on 04-09-1847. James had at least one sister, Ellen, who survived into adulthood and married Lewis Chalmers. They had at least two sons. She predeceased James who left his gold watch to her second son William. It may be deduced from the inventory of his estate and from the list of creditors and claims contained within box GD/CM/5 (Dundee City Archives) that before his death in 1865, James McEwen had already entered straitened times. Shortly after James’ death, the firm of Messrs Pattullo and Thornton placed a newspaper notice on 16-09-1865, requiring all of James McEwen’s debtors to make payment, and for creditors to lodge claims, with them within 14 days. The available list of debtors shows several marked ‘not known,’ ‘gone, left no address’ and ‘dead and gone.’ The claims of creditors are an interesting mix of accounts from Edinburgh firms of lawyers/Messengers at Arms who acted for James McEwen in connection with his business and local tradesmen such as painters and decorators/furniture restorers/seedsmen. The bundle of claims against James McEwen demonstrates fascinating evidence. There were many accounts which, apparently, had remained outstanding for years, e.g. his office at 6 High St had been extensively refurbished at least 3 years before his death, although the account of the painter/decorator lay unpaid. Had he been exceptionally poor at paying his bills, or was this state of affairs not uncommon? A complete inventory and valuation of the household furniture and effects in ‘Ellenville’ was drawn up on the same date. 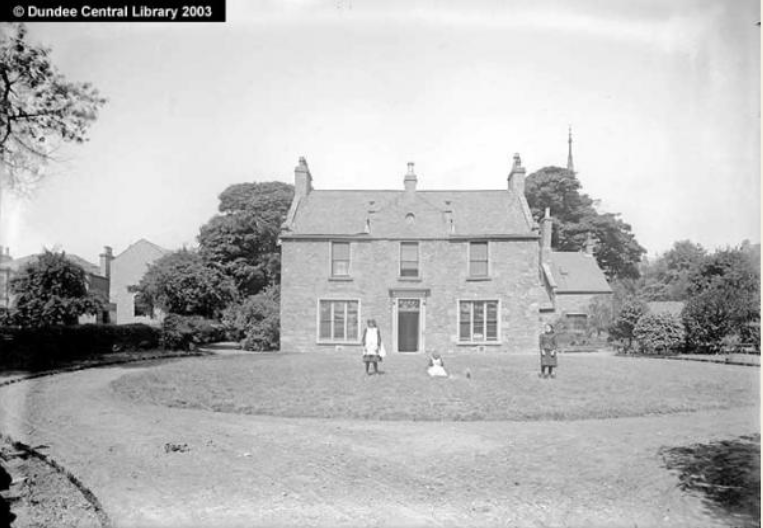 The house was advertised to be sold by roup on 30-10-1865, unless previously sold by private bargain. In the event, this sale does not seem to have gone ahead, as Mrs McEwen and her daughter continued to live there. The Inventory and the Sale Advertisement gave the impression of a very large, comfortable home with extensive and well stocked gardens. Also, in the inventory for ‘Ellenville,’ only the upstairs ‘lobby’ (landing) had items of less value than the contents of the servant’s room. However, the inventory of his estate (not recorded until 1874) stipulates the following – ‘The said James McEwen, previous to his death and upon 19 July 1864, being in embarrassed circumstances, conveyed his estate, heritable and moveable, to James Pattullo, writer in Dundee, as trustee for behoof of his creditors.’ This would appear to confirm that James McEwen’s business affairs were not at all in order. Not long after having pledged his subscription towards the building of the Albert Institute, James McEwen’s circumstances may have prevented him from making his pledge a reality. Having been survived by his wife and daughter, (the 1871 census described Mrs McEwen as ‘Annuitant’) Alexandrina died on 09-03-1884, at the age of 37 years – the cause of death given as ‘epilepsy 25 years,’ while his spouse Christina continued to reside at ‘Ellenville’ until her death in 1900. Box GD/CM/5. Dundee City Archives. Perthshire Courier, 6 May 1841. p.2. Findmypast website. Dundee Postal Directory, 1846-1847. p.133. Dundee Central Library, Local Studies. Lamb Collection. 391/15. Dundee Central Library, Local Studies. Dundee Postal Directory 1864-1865, Broughty Ferry, p.327, Local Studies, Dundee Central Library. Statutory Registers. Monifieth. Deaths. (1865). 310/ 76. ScotlandsPeople website. Western Cemetery. Burial. 7 September 1865. Section VIII 4. Burial Administration, Dundee City Council. Mitchell, Alison (ed). Monumental Inscriptions. Angus. Volume 4. (Dundee & Broughty Ferry). p.52. Dundee Courier, 15 February 1889. p.2. Findmypast website. Dundee Postal Directory, 1864-65. p.16. Dundee Central Library, Local Studies. Dundee Postal Directory, 1864-64. p.5. Dundee Central Library, Local Studies. Dundee Postal Directory, 1864-65. p.150. Dundee Central Library, Local Studies. Ordnance Survey Name Books. OS1/ 14/ 34/ 42. ScotlandsPlaces website. Howff Graveyard of Dundee. Friends of Dundee City Archives website. Census Record. Monifieth. 1871. 310/5/33. ScotlandsPeople website. Dundee Advertiser, 5 September 1865. p.3. Findmypast website. Legal Records, Wills and Testaments. Dundee Sheriff Court. (1874). SC45/ 31/ 25. ScotlandsPeople website. Statutory Registers. Dundee. Deaths. (1884). 310/30. ScotlandsPeople website. Thanks to Staff in Local History department at the Central Library; Dundee City Archives; Burial Administration at Dundee City Council, all of whom have been unfailingly helpful. Thanks also to Andy Flack, mtc, and to Lily and Hugh for support and helpful suggestions. The information above about James McEwen has been collated from a range of digital and hard copy sources. To the best of our knowledge it is correct but if you are relying on any information from our website for the purpose of your own research we would advise you to follow up the sources to your own satisfaction. If you are aware of an inaccuracy in our text please do not hesitate to notify us through our Contact page.